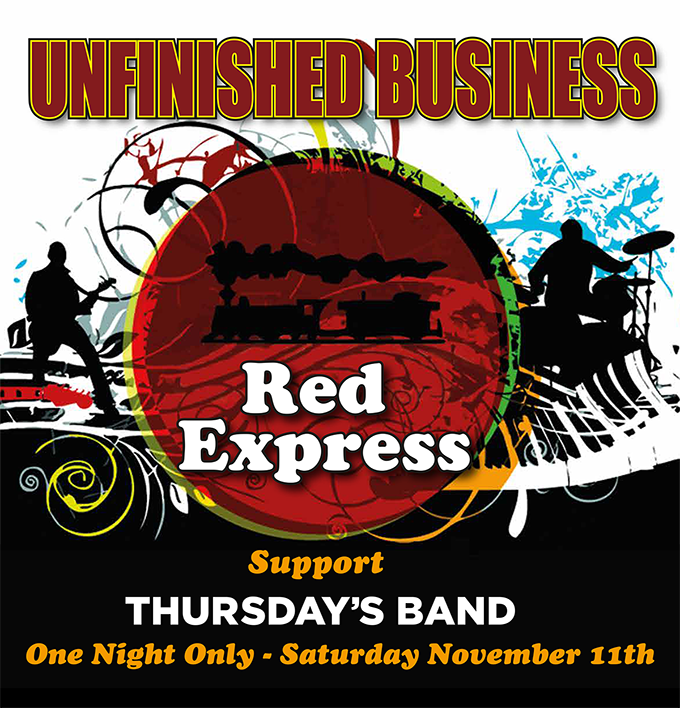 Unfinished business - following some time in the studio Red Express are playing live again one more time! Fairycroft House Media & Arts Centre, Saffron Walden. Tickets £10 with all proceeds to the Fairycroft Centre. Available from Tourist Information, Saffron Walden and the Fairycroft Centre. We're way past 2001, but that Also Sprach Zarathustra still thrills the blood - and nobody ever did it better than the much-loved and somewhat slightly legendary Cambridge funk band Red Express. Cue nostalgic weeping for the glory days of the 1970s, when men were slightly flowery but music was funky and hip - and hip-stirringly soulful. Here's the good news: Red Express are back again, for their third reunion gig in as many decades. Which is more of an achievement than it sounds, given that their lead singer Dennis Andrews lives over in California, and the band features two founder members of Shakatak - Keith Winter and Bill Sharpe, who still constantly travels the world with the band. But the administrative challenge has been shouldered, the chord charts have been studied, and the gig has been booked. So mark it in your diaries: on Saturday November 11, 2017, Red Express are back in town! The venue is suitably salubrious: Fairycroft House Media and Arts Centre, 37 Audley Road, Saffron Walden, Essex, CB11 3HD. The doors open at 19.00, tickets are a convenient £10, and all proceeds will be donated to the Arts Centre (the last time the band reformed, the gig raised several thousand pounds for the Teenage Cancer Trust). It's a special gig for another reason too: shortly before the gig Red Express are going into the studio for the first time since...well, a long time ago. So what you hear on the night should be a tasty teaser of some recordings that should have been made... well, a long time ago. Please make sure you leave your email address at the door: Fairweather Girl, Waiting for the Man, 59th Street and others will soon be available in a handy compact form you can take home and enjoy. Support on the 11th will be by the almost but not quite legendary local acoustic quartet Thursday's Band, who promise to be completely different. Variety is the spice of life! Waaaaay back in the day, when ‘thatcher’ meant someone who fixed your roof, the funkiest soul-grooving band in the Home Counties went by the name Red Express. Times have changed, but here’s the good news: somehow, despite the travails of the age, the train refuses to stop rolling. Tell your friends. Bring your mother. Grab the chance to stomp and cheer... Click HERE for the history.